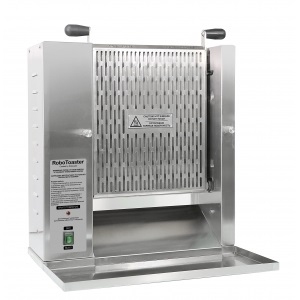 Contact conveying vertical toaster with electromechanical controls designed for split buns caramelizing. Toaster has conveying belt made of 4 mm stainless steel bars, inclined working surface for convenient feeding, detachable inclined bun tray that can be mounted in two directions. Toaster made of stainless steel; aluminum heating surface provides fast warm up and uniform caramelization. Height adjustable heating elements allow to process buns of almost any thickness (maximal possible clearance between the belt and heating surface is 20 mm). Independently adjusted pathways for crown and heel provide perfect caramelization for both bun parts. Teflon mat is a consumable item; two spare mats are provided in the delivery set.